The northwest side of Yew. 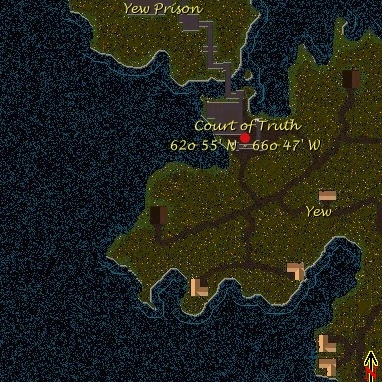 History: The Court of Truth has been around for quite some time, but really hasnt been used in years. There have been several large meetings held here for various reasons, like when Minax attacked Felucca and other grand councils of war, but the place has been collecting dust these days. 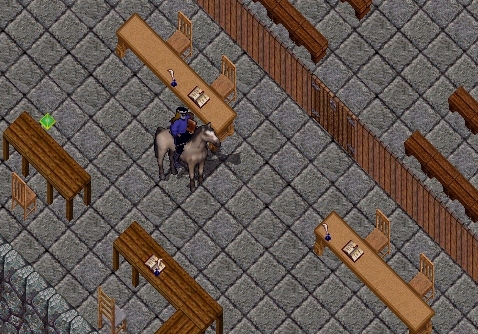 What the citizens would really like to see this place used for is to place Migon the Stranger on trial for the crimes he has committed against the people of Sosoria. The only problem is that Migon has yet to be caught, seeing how hes as slippery as a fish and smells like one too. Its believed, but I could be wrong on this and probably am, that Sage Arthur is the current magistrate who resides over the courts. Should this be wrong then I will fix it immediately and comment on whos running things from the legal perspective here in Britannia. I can see Migon already, sitting there as his sentence is given. I can hardly wait as Im sure ye can nay wait either. No offense Migon, but ye are a third class jerk. Insult intended.